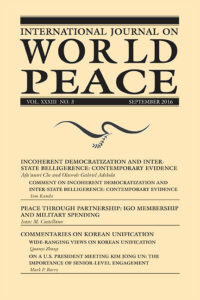 This issue of IJWP has articles that discuss three topics: peace within democracies, the relationship between participation in IGOs and state military spending, and Korean unification. All of these articles relate to the issue of justice and security of groups, whether politically or culturally united. No state wants to lose its power and no cultural group wants to lose its identity or be treated as inferior. Violence can erupt between or within states when one entity attempts to dominate or exploit another, rather than recognizing an inherent right of others to exist and act in the world. In principle, democracy reflects a level of consciousness that considers everyone as having an inherent right to exist and to cast a vote for a common future. In practice, there is no existing democratic political regime that entirely reflects this ideal. The institutions of governance, whether between states or within states, have not been well-enough perfected to eliminate unequal treatment under the law. Many factions, whether they be political, economic, or cultural sub-groups, have been able to influence political systems to favor their own interest at the expense of others. And, the institutions of culture often fail to transcend an in-group / out-group group-centered consciousness that would treat other ethnic groups, economic interests, or political parties with due respect. This can happen both in the process of establishing a new democratic entity, or with the corruption of an existing one. The first article, “Incoherent Democratization and Inter-State Belligerence: Contemporary Evidence” by Afa’anwi Che and Oluwole Gabriel Adekola acknowledges the general democratic peace theory that democracies are less likely to begin a war than dictatorships. But weak institutions in democratizing states are likely to lead to more belligerence. Using the case of ethnic unrest in Nigeria, their research suggests that “ethnically inclusive institutions potentially increase mutual trust between ethnic groups in hitherto polarized polities.” It is particularly important that political institutions be non-exclusionary before democratic elections to prevent election violence or disruption. Looking at the increased belligerence among the two dominant political parties in the United States, it might be useful to expand this type of research to not only democratizing states but to post-democratized states. A significant ethnic and cultural unity was fostered by the common experience of the colonies under British rule and revolution against that rule. The Constitution was drafted while enough intergroup camaraderie existed to form a voluntary union. Many provisions in the Constitution have proven inadequate in preventing subversion of the democracy by political, economic, and cultural interests over its 227-year life. 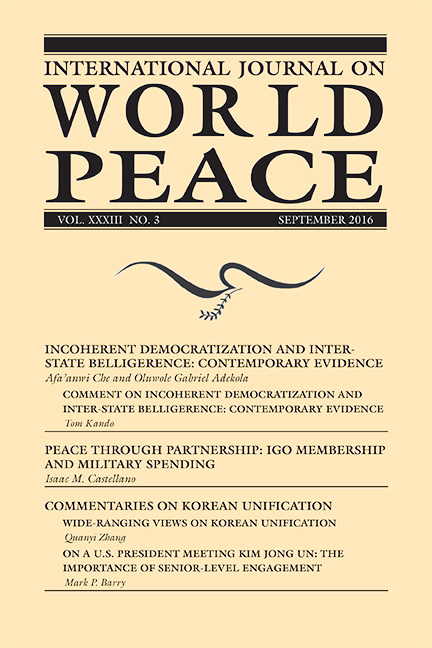 Our third article is composed of two commentaries on the possibilities for unification of North and South Korea, the first from Quanyi Zhang, professor of political science at Zhejiang Wanli University in China, and the second by Dr. Mark Barry, Associate Editor of IJWP, an American who has followed U.S.-North Korea relations for 26 years. Both scholars consider North Korea to be problematic, being run as a family dynasty rather than a normal state. The Chinese, who view South Korea as a vital trading partner, are increasingly annoyed with the irresponsible behavior of the North. It is in their interest to unify North and South Korea to bring stability to the region. The existence of the two Koreas continues to prolong the Cold War tension between the U.S. and China, and China would like to see demilitarization of the peninsula. On the other hand, South Korea seems to have no serious interest in unification, with most in the South having learned to accept living with the aberrant state to their North, and the U.S. has strategic geopolitical interest in keeping troops and arms in the region. Barry is not optimistic for Korean unification in the near future, but suggests there are a number of things that the U.S. could do to improve the situation. The first thing is to recognize and normalize relations with North Korea, treating it as an existing state without compromising the U.S. position on long-term denuclearization of the peninsula or respect for human rights, replacing U.S. belligerence with fairness and firmness. Such an approach should also ease some of the tensions that still exist between the U.S. and China. In a community of nations, dislike for a regime accompanied by belligerence or the attempt to promote regime change is somewhat comparable to the inability to accept people of other racial, political, religious, or ethnic groups within states. North Korea might be less able to provide for its citizens than most other states, but it is more likely that the regime would become less belligerent, less preoccupied with military defense, and more concerned with the lives of its citizens if relations with other states were not hostile. This same principle also applies to inclusive institutions in democracies. Not all ethnic or religious groups equally prepare their children for life in a secular school or a modern economy, but neither refusing to accept outsiders, as many conservatives do, nor blindly ignoring weakness in other religions and cultures, as liberals are prone to do, is the best response. For example, accepting the right of a Muslim to live in the West while rejecting Sharia law might be compared to Barry’s suggestion that the U.S. accept North Korea’s existence as a state while rejecting the idea that it should build a nuclear arsenal.